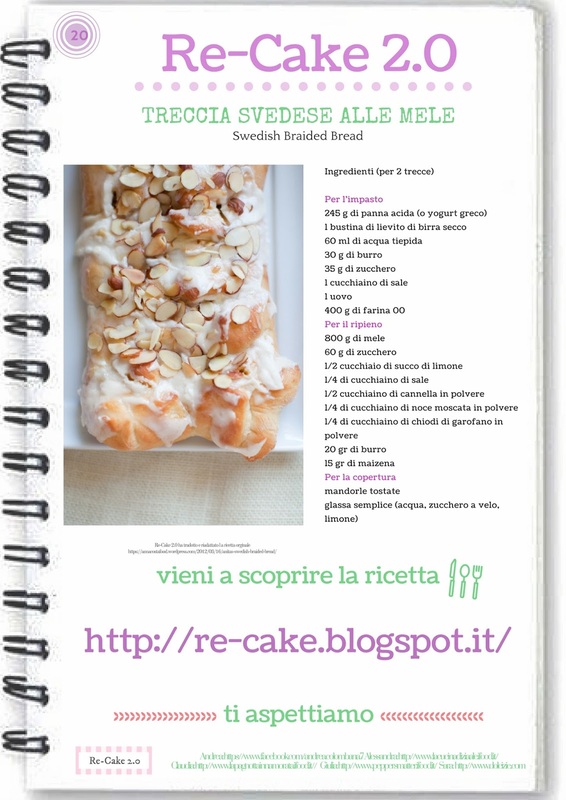 This month Re-cake 2.0 offer a sweet and delicious recipe. A sweet braided braid for a cup of tea or coffe to share with our family and friends. Heat the sour cream in microwave until lukewarm. Add butter to the sour cream. (this allows the butter to soften. Dissolve yeast in warm water. Stir in sour cream, butter, sugar egg and 2 cups of flour, beat until smooth . Mix remaining flour to make dough easy to handle. 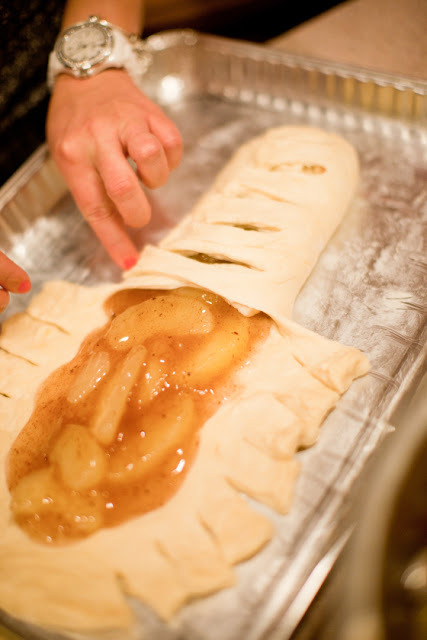 Divide the dough in two parts- Roll each part into rectangle and place the half of apple filling in each bread. Cut along the side of the dough with scissors and pull the dough across the top of the filling to create a braided effect. Place on a buttered cookie sheet. Bake for 20 minutes or until golden brown. In a bowl put the apples cut into wedges and mixed with lemon juice, spices, sugar and salt. Let stand for 30 minutes. and pour in a saucepan with butter and cook for 5 minutes, Add the cornstarch to apples and the the syrup you made. Mix the powdered sugar, water and lemon juice, stir well, you can add more sugar or lemon for more thick. While the braid still is warm brush with icing and sprinkle with toasted almonds. A week or so ago it was my mom's birthday (some of you know that she is living here in my house) and I prepared this cake of chestnut and chcolate cream, it was delicious, you can use chestnut puree from jar or tin. I had frozen ground chestnuts. My mom loves chestnuts like me. In a bowl beat the yolks until they are thick. Slowly add the sugar, salt and vanilla, beat constantly until the batter is pale and thick. Gradually add the flourand cornstarch and mix. In another bowl beat the whites until they are firm and incorporate the sugar . Pour the batter into a round mold of 20/24 cm. Lined with butter and buttered paper. Bake for 25 minutes or until golden and fluffy. Leave to cool for about 5 minutes in the oven. Remove and allow to cool before unmolding. Beat the chestnut puree with the butter, rum, sugar and vanilla until smooth.Set aside. Gently heat the chocolate and cream together in a double boiler or a microwave set on low power. Stir until smooth, remove from heat. Carefully transfer one place to a serving tray and brush generously with rum syrup and spread the half of chestnut filling. Repeat with other layer brush with rum and place the last on top. Spread the chocolate cream over the top and sides of the cake. Set aside for a while and put in fridge before serve. Garnish with some cherries or other red fruits like strawberries or raspberries. I was looking photos that I still had in the camera and I find this quiche! I remember it was delicious. And why the hell did not I do it again? Aah the voragine called Christmas and New Year! And now I see it and I love it. Is true I love quiches but this is wonderfully simple with its flavor of tomatoes and basil. To make the pastry combine the flour and butter using your fingertips until the mixture resembles fine breadcrumbs. Add 2 tablespoons of cold water and begin to pull the mixture together into a ball, if needed add the final tablespoon to form a soft dough. Roll out the dough on a lightly floured work surface large enough to line a 20 cm tin (8 inch). 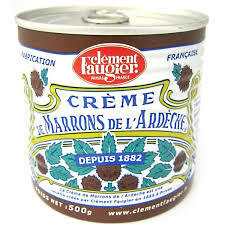 Press the pastry gently into the tin ensuring it lays smoothly against the fluted sides. Chill in the frideg for 30 minutes. Once chilled line the pastry case with foil and fill with baking beans or rice) as long as they are dry and heavy enough to prevemnt the pastry from puffing up. Blind bake for 15 minutes and then renove the beans/foil and continue to bake for 5 minutes to dry out the centre of the base. Keep a close eye on the tomato/onion and remove once the tomato start to pop open and onions caramalise. Beat together the eggs and cream before adding the basil and seasoning with salt and pepper. Pour over the egg/cream mixture until it just reaches the top of the pastry case and finally top with the rest of mozarella. Bake for 15 to 20 minutes until the top is set and appears golden brown. 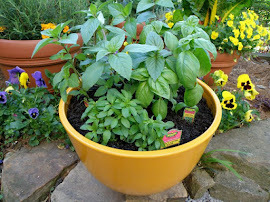 Leave the pastry cool in the tin the remove onto a serving plate and top with fresh whole basil leaves. As many of you know here in the southern hemisphere we are in summer. I can not stand the heat. I just want my Autumn. Now the good thing about summer is the fruit (and being able to swim) the cherries have been beautiful and I have done some things, this I did days before Christmas. And seriously a Cream brulee with cherries is divine !! It can be made with cherries in jars that are used for cherry pie. Happy new year to all who stopping by here! And thanks for the friendship . Add the double cream into a sauce pan . Add the vanilla extract into the cream. Heat up and simmer the cream mixture about 5 minutes. Meanwhile whisk the sugar and egg yolks together in a large bowl until pale and fluffy. Pour slowly the hot cream over the egg mixture while whisking continously until thickened. Strain the mixture through a sieve into a nother large bowl. Distribute the cherries in quarters or black cherries syrup in the bottom of the ramekins and cover with the mixture of vanilla and eggs. Place the ramekins into a large roasting tray and pour in enough hot water to come halfway up their outsides and place the tray in the oven, and bake for 40 minutes. Before serving sprinkle 1 teaspoon sugar evenly over the surface of each cream brulee and then caramelise with a blow torch.